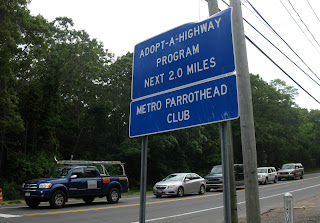 Obviously, this is the road to Margaritaville. 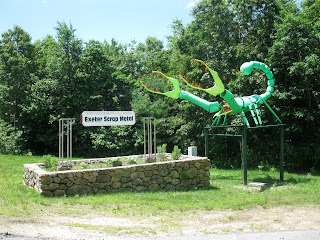 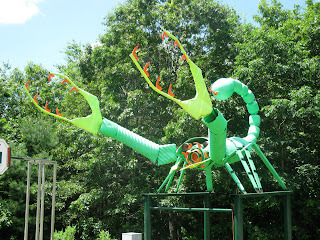 We've blogged about our adopted hometown of Exeter, Rhode Island and its rural, "there's no there there" vibe, so you can imagine our delight when we spotted a giant green and yellow scorpion made up of old propane tanks, engine parts and other scrap metal castoffs gracing the side of main-drag Route 3. Exeter is already an eccentric little place, what with the Middle of Nowhere Diner and Yahgoo Valley, Rhode Island's only commercial downhill skiing "mountain," but this really puts the town on the eccentric roadside attraction map. To those who ask why a predatory arthropod or why green and yellow, we would offer why put a smile on the Mona Lisa? 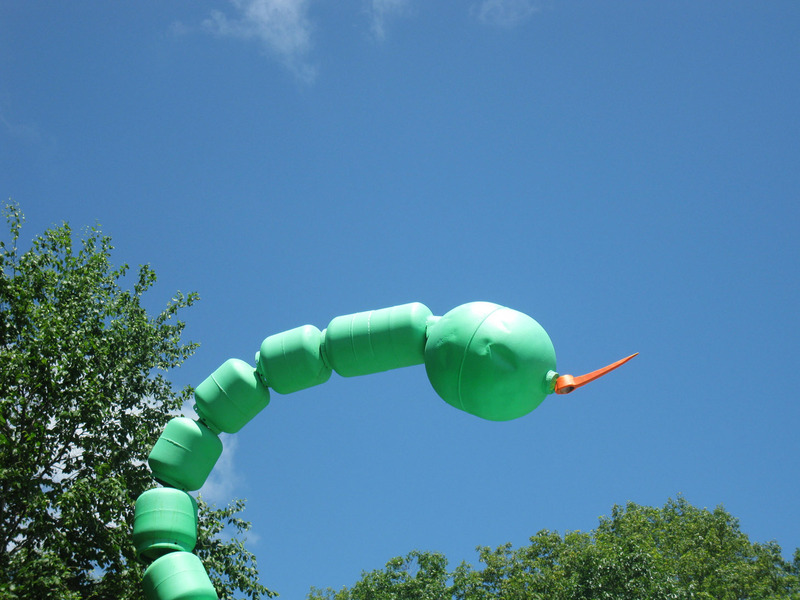 An artist follows his muse, especially when he's got to use whatever materials he's got lying around. 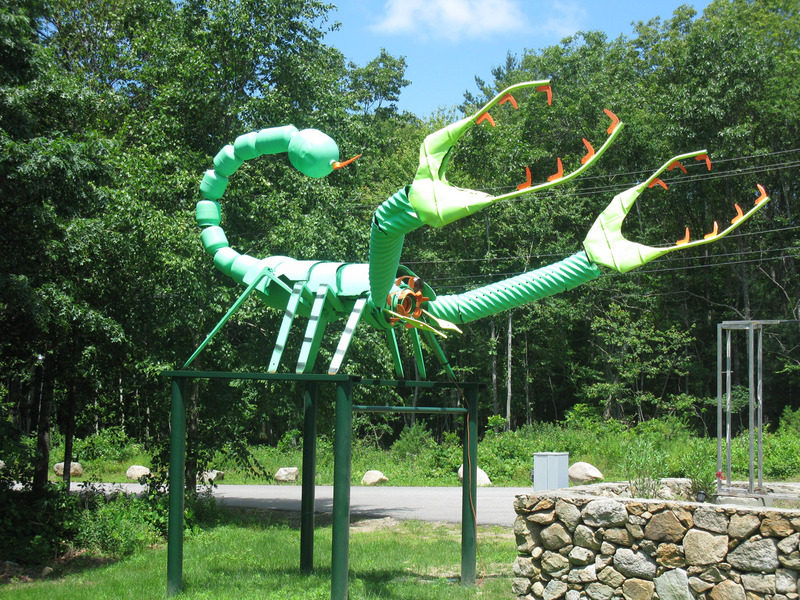 Our hats go off to Exeter Scrap Metal and the talented artist that put this roadside delight out there for all to drink in. 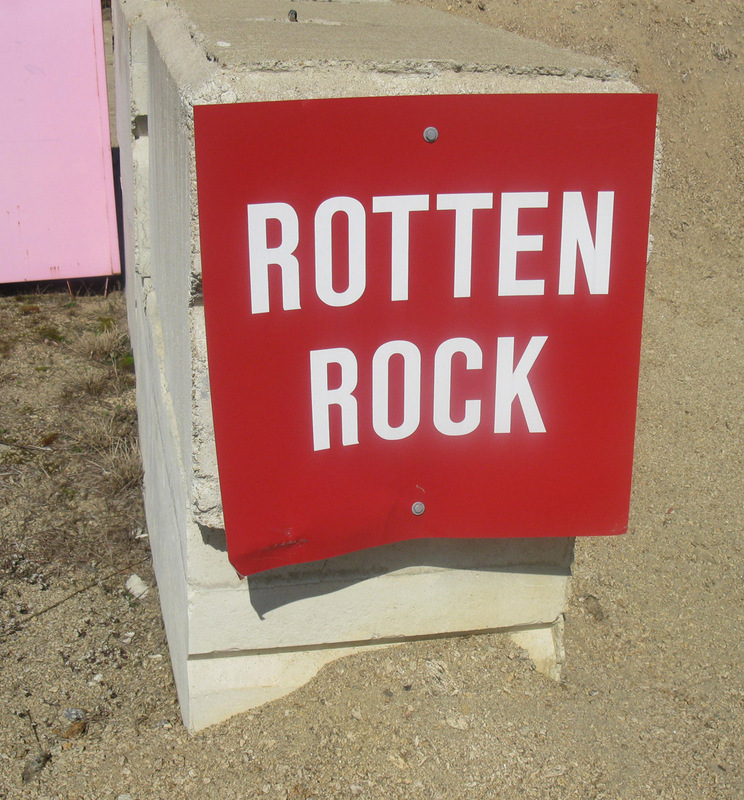 You rock us like a hurricane. 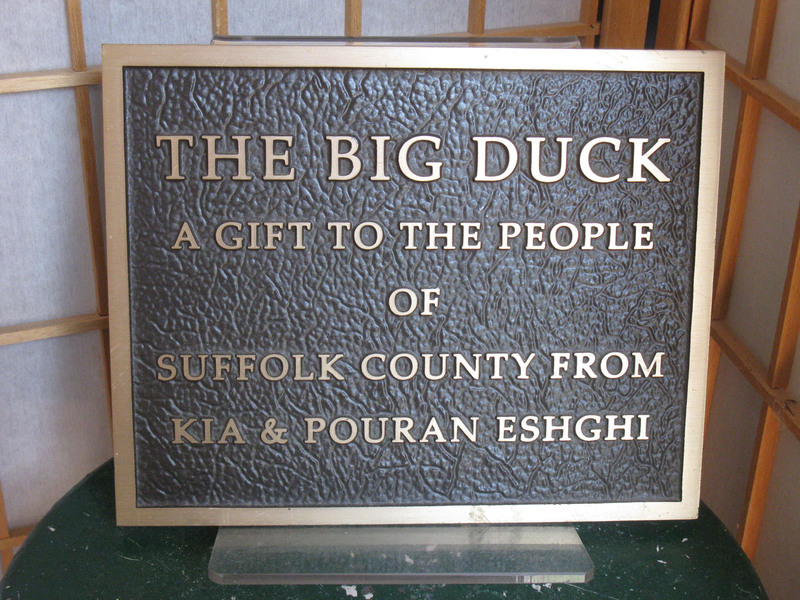 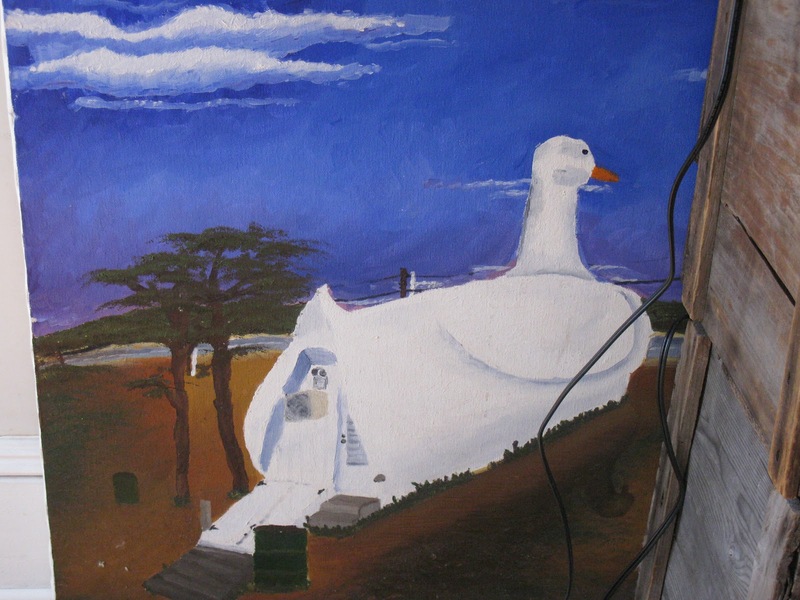 Kia and Pouran Eshghi generously donated The Duck to Suffolk County, New York back in 1987. 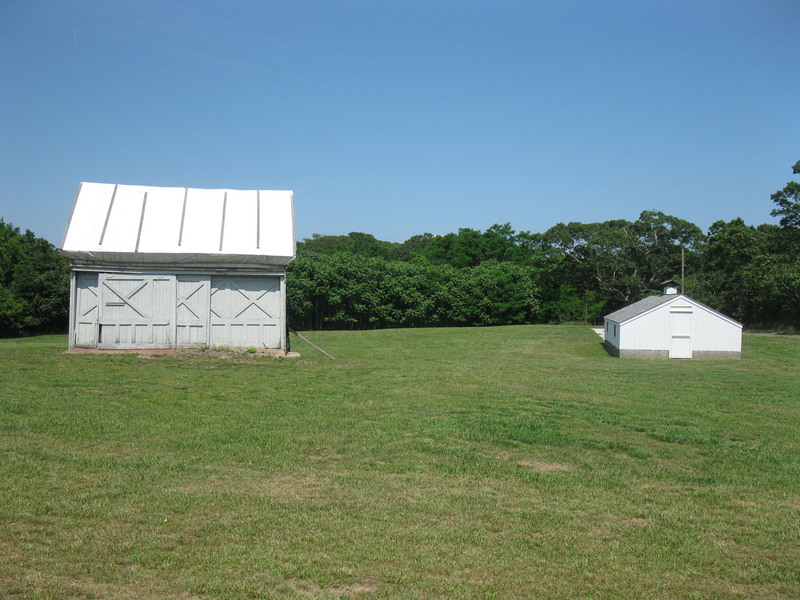 These buildings, part of the original duck farm, are also on the property. 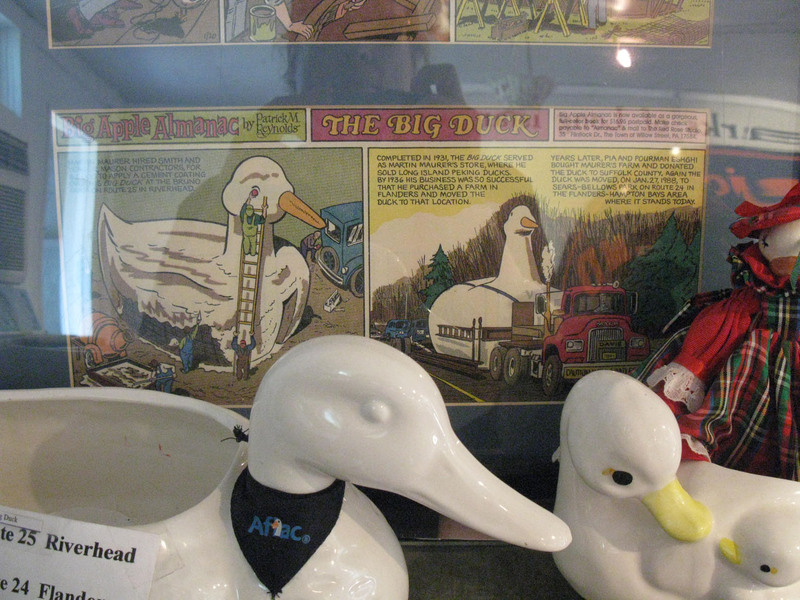 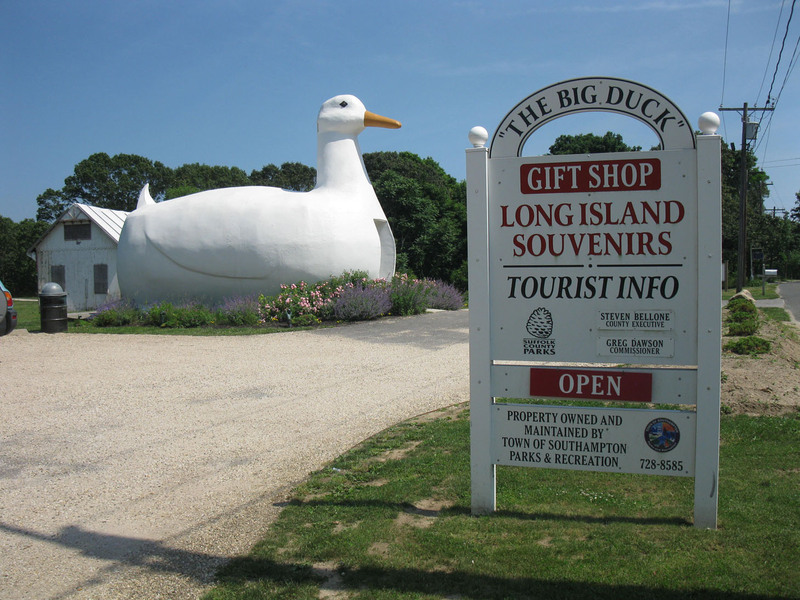 As an eccentric roadside attraction, The Big Duck really fits the bill. One of the all-time great eccentric roadside attractions resides on Route 24 in the town of Flanders in Suffolk County on Long Island in New York State. There you'll find a 15-foot wide, 30-foot long and 20-foot tall white concrete duck that dates back to 1931. 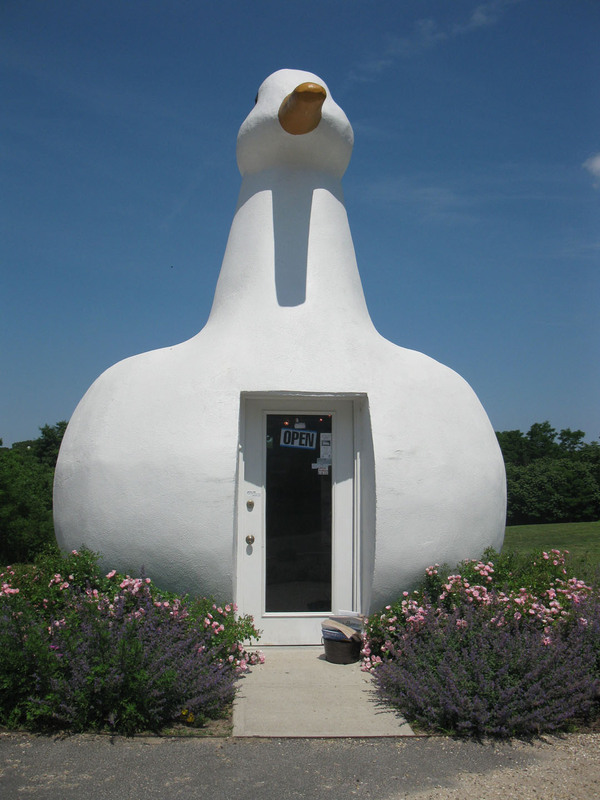 It's such a beloved figure that it is on the National Register of Historic Places, and rightly so, for it is a marvel to behold. Eight-one years ago, Martin and Jeule Maurer were raising Peking ducks and wanted to bring attention to their Riverhead, New York duck farm and business. Inspired by a building shaped like a giant coffee pot they had visited out west, they decided to put up a duck-shaped dwelling to get the attention of West Main Street motorists. The Maurers collaborated with a carpenter and two stage show designers to create a giant wooden duck frame that was covered in wire mesh and then cement. 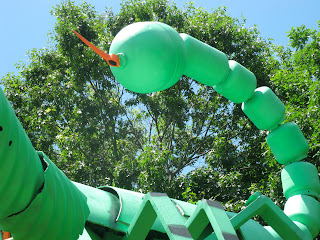 The structure was painted a pleasing bright white, with orange for the bill and Model-T taillights for the eyes. The building was so striking, the Maurers renamed their shop and business The Big Duck Ranch. 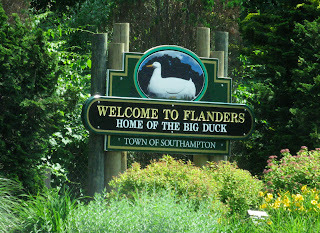 They relocated their business and the Duck to the nearby town of Flanders in 1936 where it roosted until 1987. 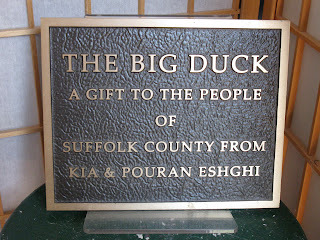 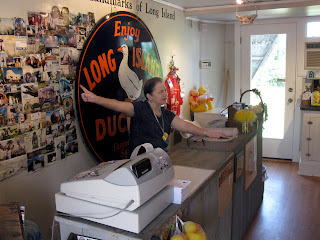 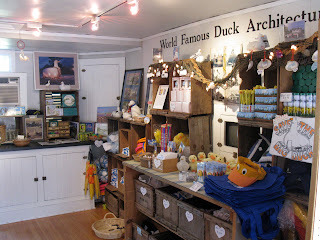 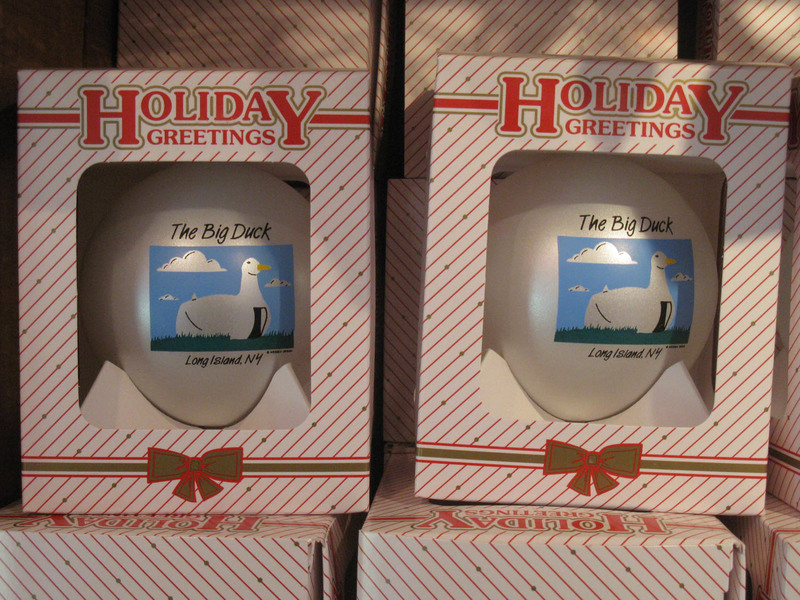 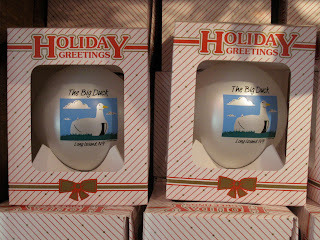 No longer using the structure, the Duck's then-owners, Kia and Pouran Eshghi, donated the lame Duck to Suffolk County, who moved it to another location on Route 24, and then back to its original Flanders spot in 2007 where it sits today as a gift shop and good will ambassaduck. 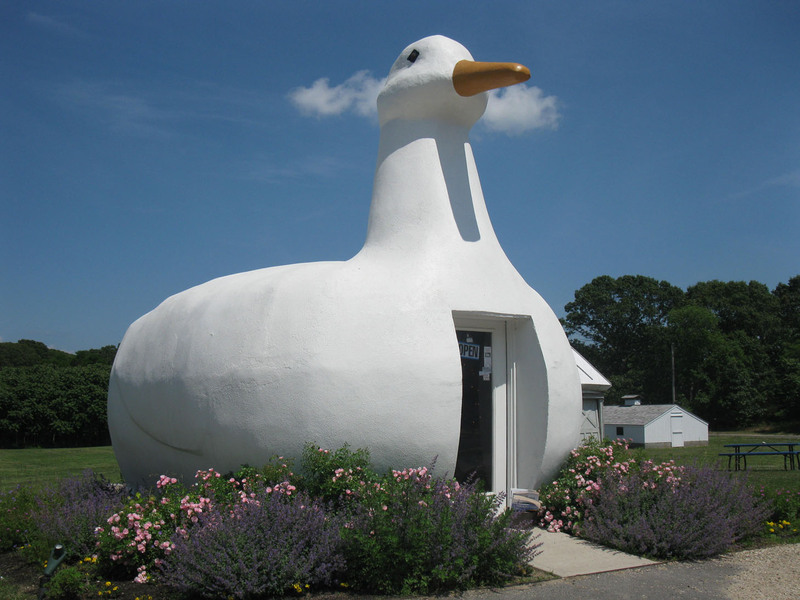 The Duck is such a perfect example of a building in the shape of the product sold within that the term "duck" is now used by roadside architecture buffs to describe just such a structure. 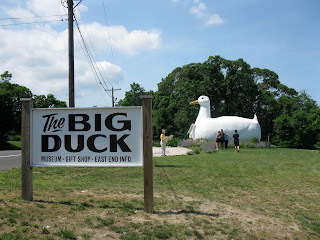 Buildings that functioned as colossal 3D representational advertisements were once common along pre-Interstate highways but are rare commodities today, so the Big Duck is a big treat, indeed. Let's hope they protect and cherish it for another 81 years...I'd be down with that. 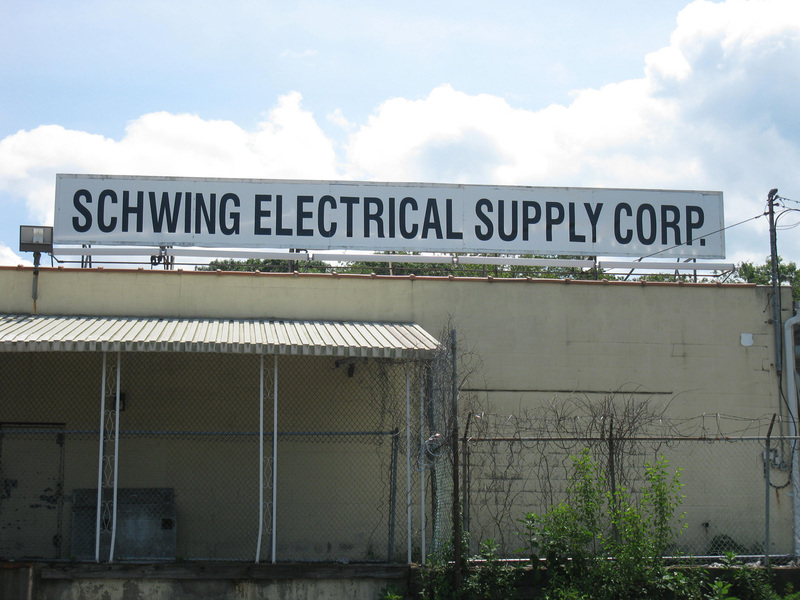 And the winner is Schwing Electrical Supply Corp. of Long Island, New York. 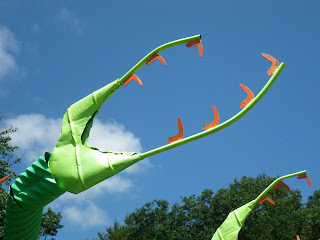 Party on, Wayne. 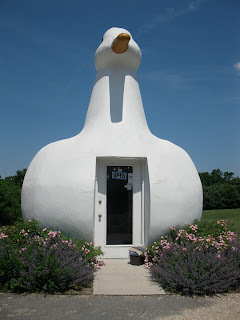 Party on, Garth. 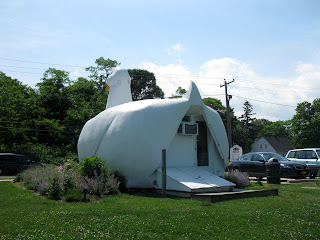 I believe this is in the heart of town. 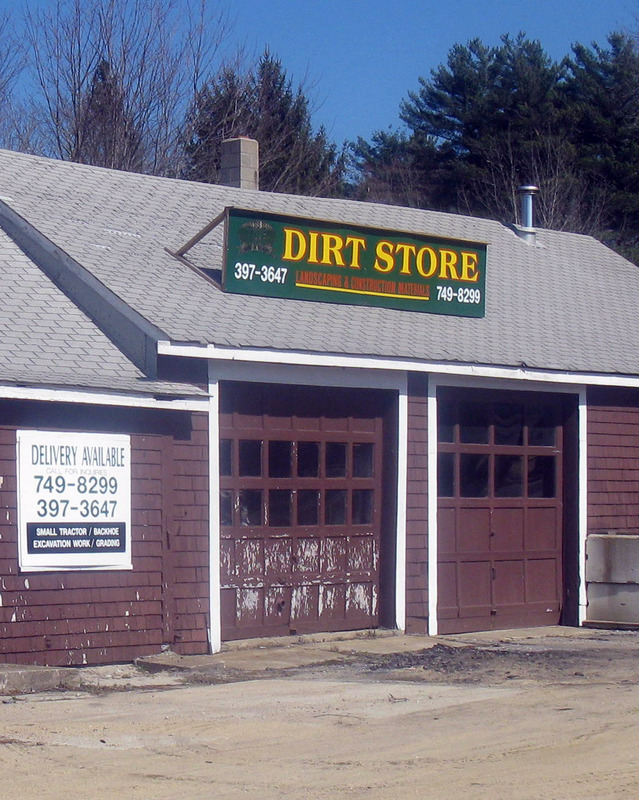 And I think there's a guy named Gerry who lives there, too. 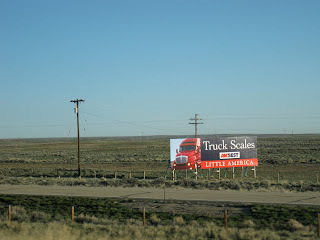 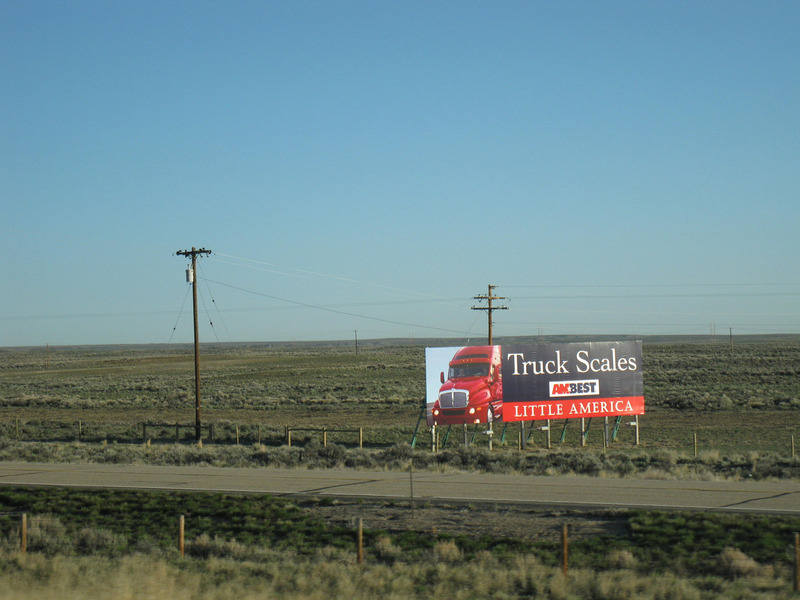 Little America is one of those places that put up billboards for miles and miles along the flat landscape before you get there. Love places like that. 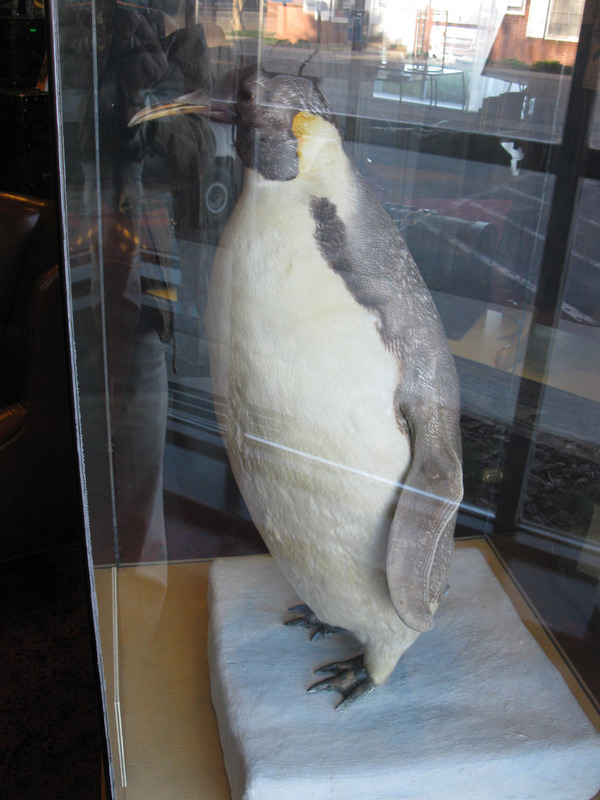 Emperor the penguin greets visitors in the lobby of Little America. 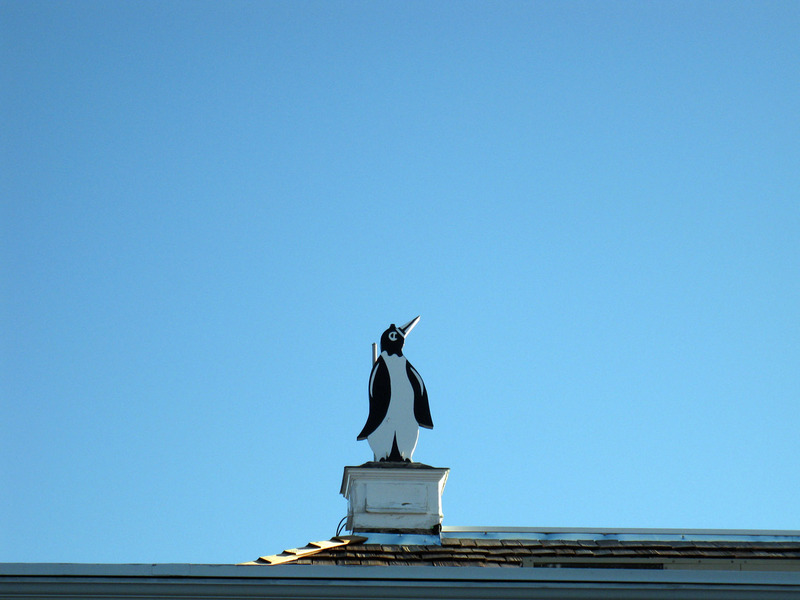 They make the most of the incongruously delightful penguin motif. 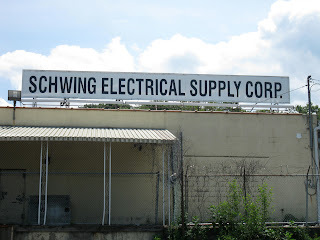 Back in 1932, an entrepreneur named S.M. 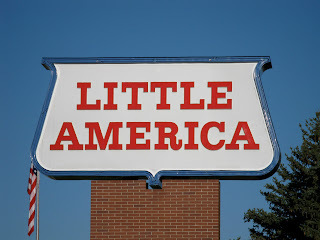 Covey opened a way-station for travelers along the Lincoln Highway 60 miles east of the Wyoming-Utah border, and since the area was rather desolate, he named it Little America, after Little America, Antarctica, Admiral Robert Byrd's barren South Pole outpost. 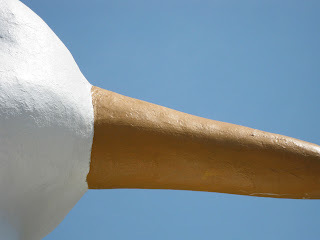 In keeping with the arctic theme, Mr. 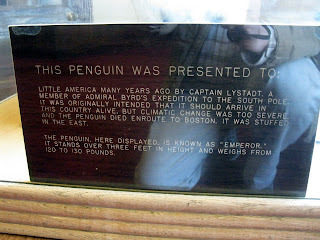 Covey requisitioned a Mr. Isak Lysad, a member of byrd's expedition, to bring back a genuine living arctic penguin as his business's mascot. Unfortunately, on the trip between the two Little Americas, the bird perished before it could waddle on the Wyoming high plains. 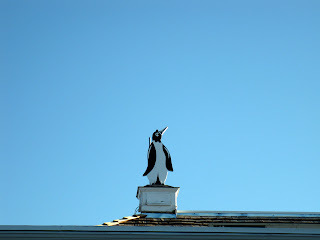 Undeterred, Mr. 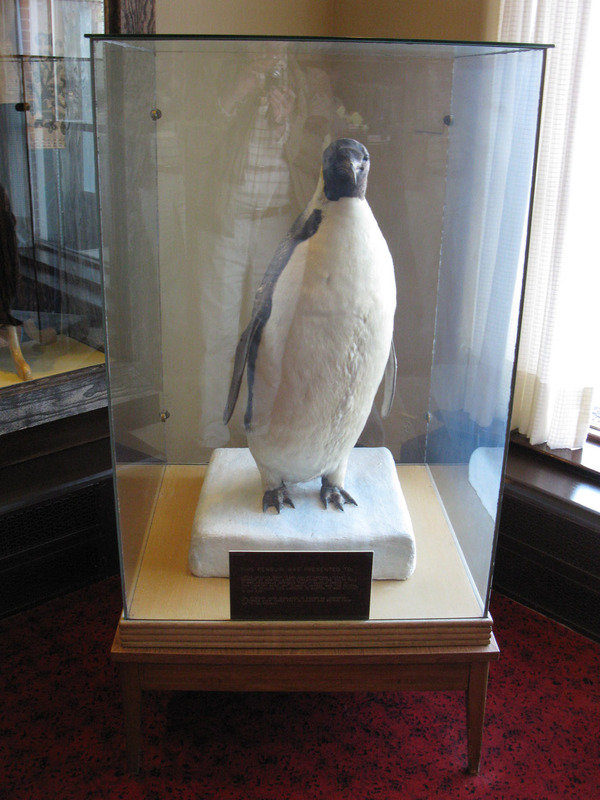 Covey had the bird stuffed, named him Emperor, and put him in a glass case in the main lobby, where he's been residing since the 1940s, as close as anyone can guess. 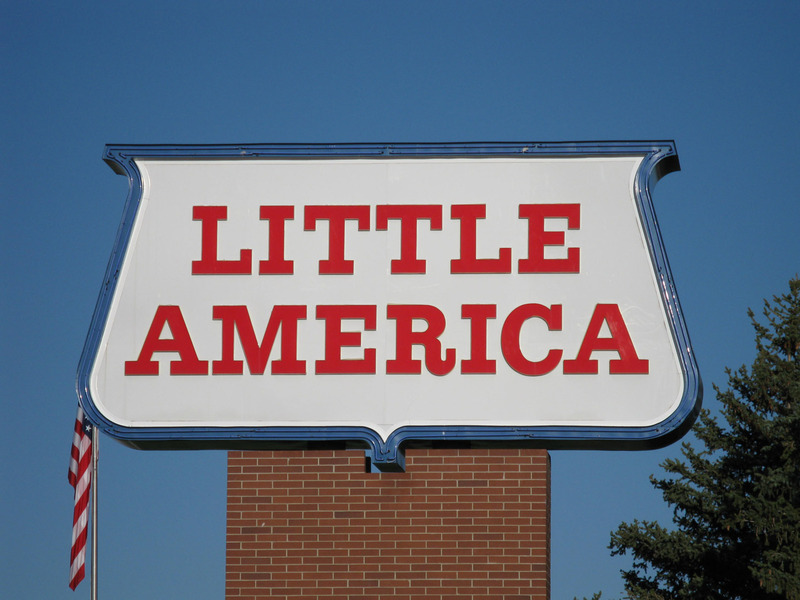 A lot of Little America has changed since the early days: the Lincoln Highway is now Interstate 80, Mr Covey sold L.A. in 1963 to new owners who expanded it into a chain including a 5-star hotel in Salt Lake City, and gas has gotten a lot more expensive. 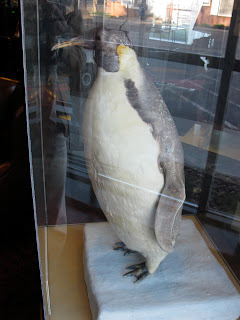 But Emperor still sits in his glass case, as if to say "What are you looking at?" 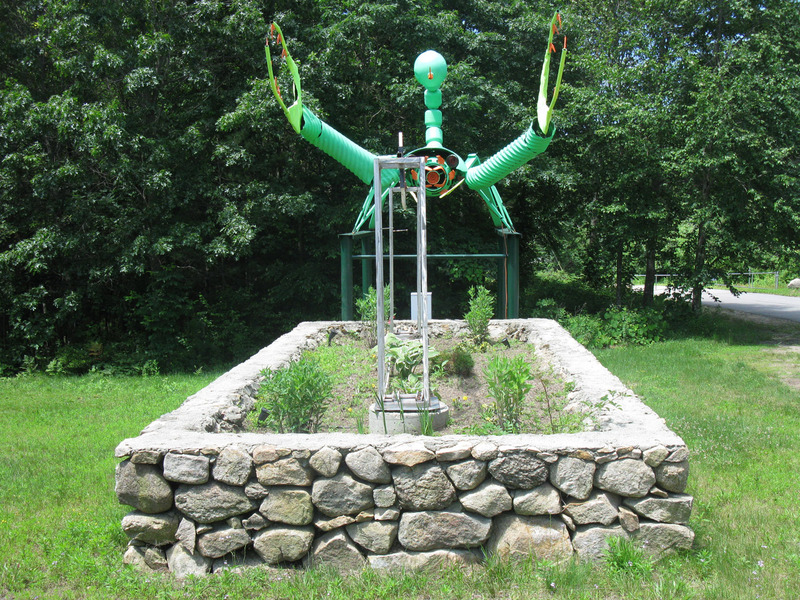 to the tourists who come by, many of whom are adults who saw him back when they were kids. 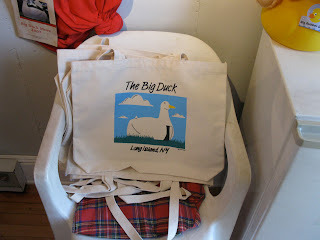 And he's got his formal wear on just for the occasion. 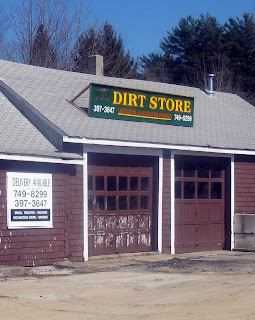 While tooling along the highway in northwestern Rhode Island, we hit pay dirt with this establishment, where they'll float you a loam, give you gravel-to-gravel coverage and really move the earth for you. That's soil folks! 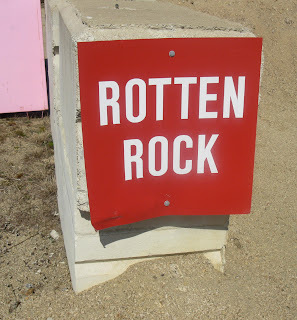 Time for one of the eccentric roadside all-time greats. 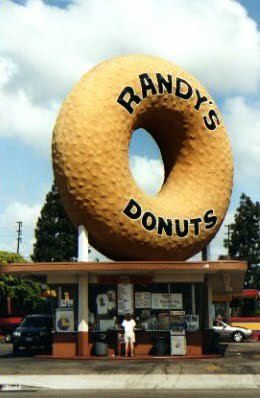 Randy's Donuts is not far from the LAX airport in Inglewood, California, and started out as part of the Big Donut chain of 10 donut drive-ins in 1953 (four of the buildings remain today under different names). "It's a classic example of mid-century programmic architecture, where the shape of the building represents the product sold within," says the Los Angeles Conservancy, and they ought to know. 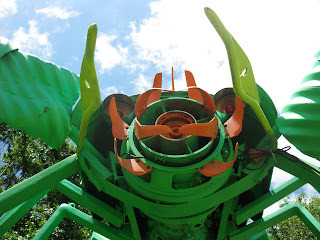 It's been featured in the movies "Mars Attacks" and "Earthgirls are Easy" as well as Randy Newman's "I Love L.A." video (at 3:13 in the video to be precise). 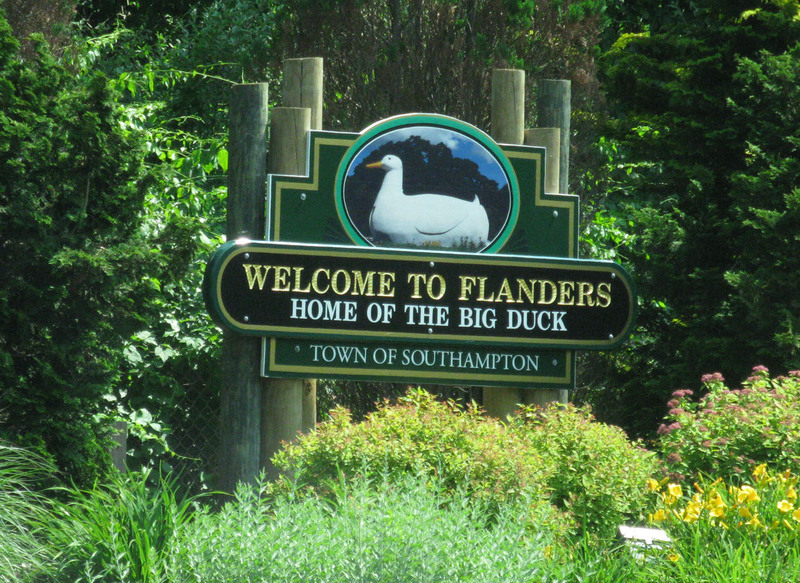 The Simpsons have also paid loving homage to Randy's. 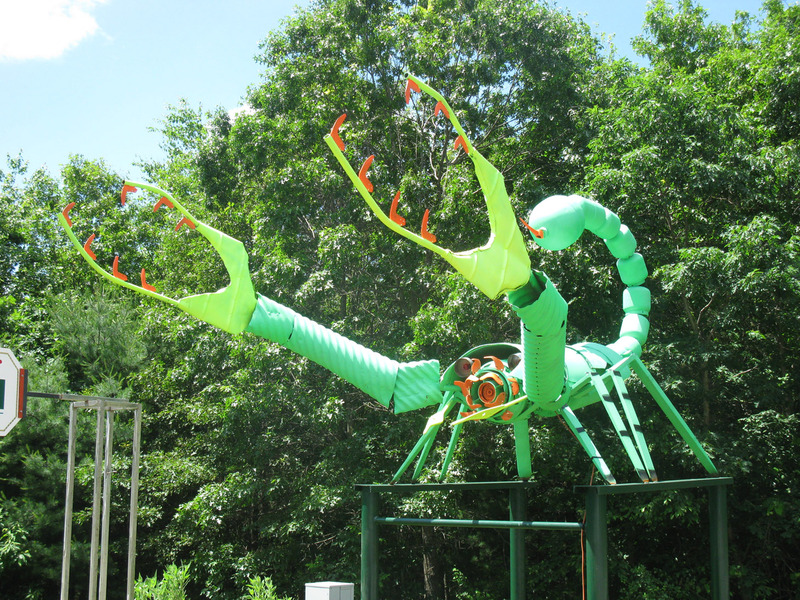 There's something about an eatery with a 32-foot steel and gunnite orange deep-fried pastry on top of it that makes you feel like like is worth living: Your eyes glaze over. Things that were frosting you before somehow donut seem to matter. 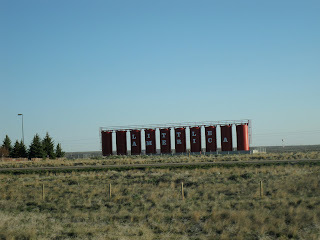 You realize this tower of powder is a horse of a different cruller sprinkled with love. And that's the hole truth, I eclair, so help me carb.